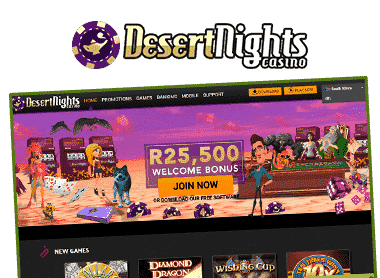 Over the past couple of years, Desert Nights Casino made a few changes in the approach how it rewards existing customers and the ongoing promotions in particular. Now, you don’t have to blindly follow the newsletters. Instead, there are three ongoing bonus deals which you can claim during the respective promotion periods. For example, there’s a midweek match bonus. You can reload your account balance on Wednesday, and on weekends you can get another reload bonus topped with some free cash. A monthly bonus is also available once per month. Nevertheless, the newsletters are still a great source of special, limited time promotions. These usually come with the so called Desert Nights Casino promo codes. If you have any questions or concerns that need addressed, Desert Nights Casino support staff are available around the clock to assist you. For the fastest assistance, use the live chat function within the casino lobby or on the Desert Nights Casino website. The casino also offers email support through three different email addresses to expedite response times. Deckmedia owned casinos are generally well run on the back end of things, making Desert Nights a stable place for players to deposit and withdraw funds from. As we know, USA-friendly casinos are restricted when it comes to payment options, and Desert Nights is no exception. Currently accepted forms of deposit include credit and debit cards and e-wallets, with US players restricted mainly to their choice of plastic. Players are able to request a Bank Transfer, EcoCard, Neteller, or Skrill withdrawal, along with a paper check. It should be noted that Desert Nights is very prompt when it comes to conducting their banking operations, as deposits are handled immediately, and payouts are processed within 2-3 business days, though American players requesting a check should expect to wait up to a week before it arrives in their hands. This is a respectable time frame, though nowhere near the fastest in the industry. However we have rarely heard of anybody having a legitimate issue with Deckmedia paying winnings. One thing I was disappointed with though is the small weekly withdrawal limit. Desert Nights currently limits withdrawals to $2000 per week, progressive jackpot winnings excluded as stated above. While this may not concern most people who play at low stakes, those of you who like to wager bigger amounts would be advised to look for a casino with higher limits. Customer service is very knowledgeable at handling any potential issues or questions that punters may have, and are available 24/7. Agents are on standby to assist via instant message, email, telephone, and fax. Desert Nights is one of the best of the admittedly mediocre bunch of Rival casinos. The software runs smoothly, the games are colorful and inventive, and the casino accepts American players. While we wish there was a higher weekly withdrawal limit, there really isn’t much else for us to complain about with this casino.